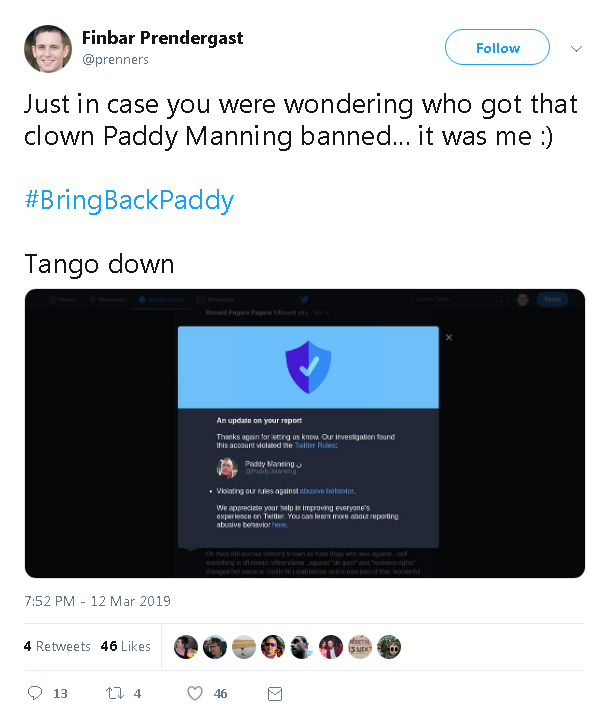 In March 2019, a malicious Twitter user called "Finbar Prendergast" (user prenners, less than 50 followers) abused the Twitter complaints process in order to get Twitter to ban popular right-of-centre Irish commentator Paddy Manning (user paddyjmanning, 12,000 followers). Twitter's complaints process is incredibly broken and wide open to this kind of abuse. This page explains what happened. It seems unlikely this is a real name or real photo. 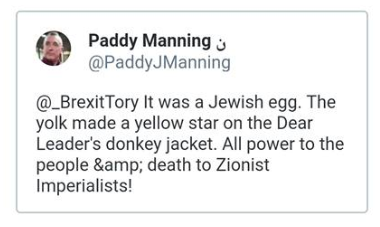 Paddy Manning tweeted this harmlessly amusing tweet after an egg was thrown at the extremist British politician Jeremy Corbyn on 3 March 2019. He is slagging off the anti-semitic conspiracy theorists that flock to Corbyn's Labour. 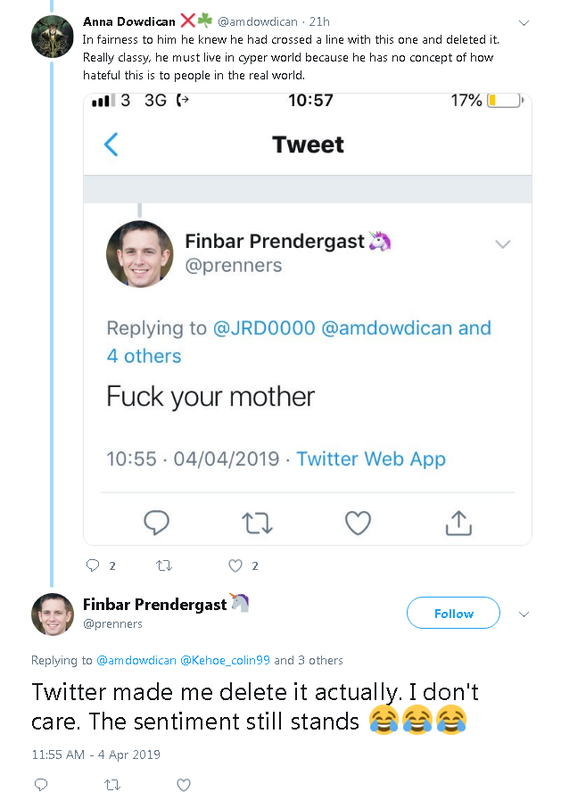 This guy Finbar Prendergast, who disagrees with Paddy's politics, decided to try to get Paddy banned for the above tweet. So he made a malicious complaint. Maybe the AI bot or outsourced worker dealing with the complaint could be fooled into thinking Paddy's tweet was anti-semitic, rather than slagging off anti-semites. It worked! Paddy was banned from Twitter. See full size. From Paddy's Facebook. Finbar Prendergast boasts that it was him who made the malicious complaint. He is delighted that it worked. What a feeling of power for someone whose tweets no one wants to read to silence someone whose tweets thousands of people want to read, but now cannot. We cannot follow Paddy any more, because we all must obey Finbar Prendergast. What a rush of power this must be for him. 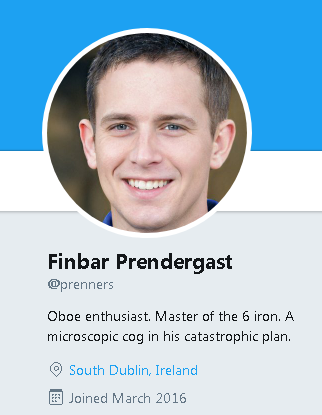 I don't think Finbar Prendergast is an anti-semite. I think he just enjoys making malicious complaints and getting people banned. Twitter needs to fix this. And remove Finbar Prendergast's account. It's all a game to the troll. He is having a great time. Twitter is allowing no-follower trolls like him to take down popular, highly-followed accounts. Imagine being a business and allowing drunken non-customers ruin the experience of actual customers. In response to this page, this guy has gone completely mad. He sends a shooting threat to someone. Twitter listens to the pious, pleading (and entirely fake) complaints of trolls like this. 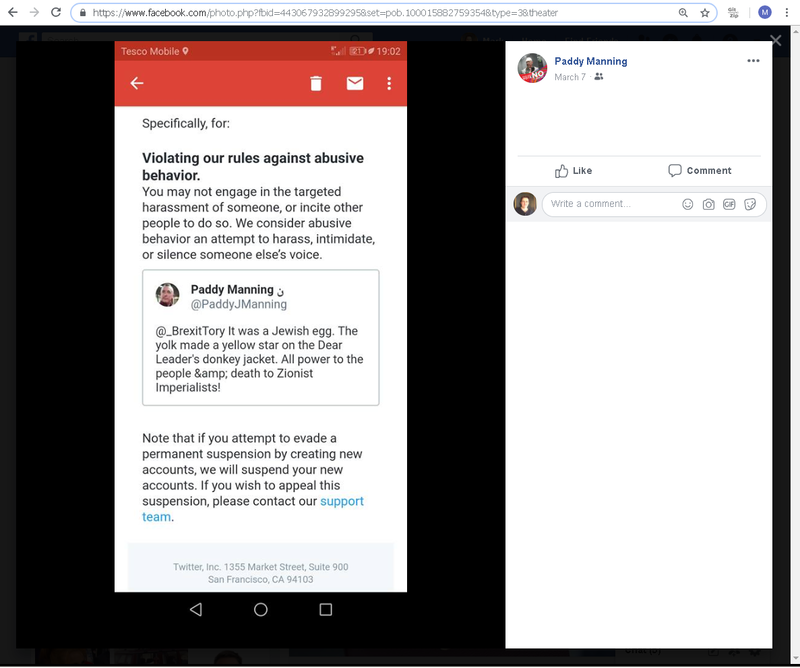 In April 2019, after many complaints about his behaviour, from many people, the troll prenners was suspended. But Paddy Manning is still gone. Twitter is still obeying the troll that they themselves suspended. Of course the troll didn't care he was suspended. He just opened a new account and came back as prennerss. He then switched to FinnbarrP. If you are anonymous, like the troll, you cannot be banned from Twitter. 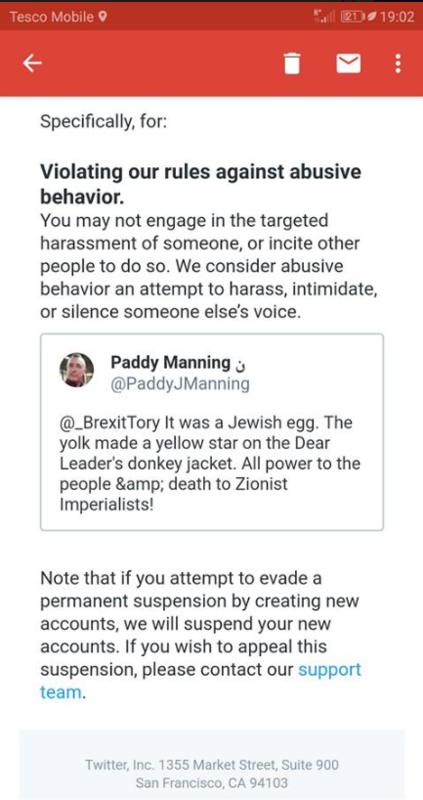 If you give your real name, like Paddy Manning, you can be banned from Twitter. Anonymous drunken trolls (who no one follows and who would never pay Twitter anything) can get real public figures (who thousands follow and who would happily pay a subscription) banned. Twitter's business model is a mess.